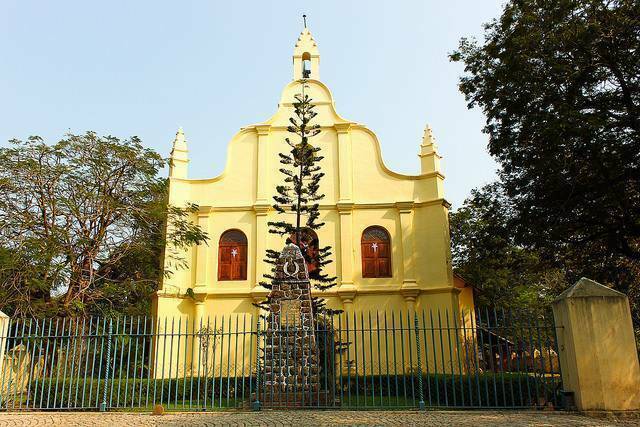 St. Francis Church, in Fort Kochi is a beautiful church that stands white and proud in its red courtyard with the backdrop of green palm trees against the blue Kerala sky. This is a functioning church, and tourists are welcome to visit or attend services. The Church was built by Vasco da Gama, together with Pedro ÁlvaresCabral and Afonso de Albuquerque. Vasco da Gama passed away in India, and was originally buried in the church, before his body was removed back to Lisbon.